Can I add an occupancy sensor to a 3-way circuit? If I replace one switch in a 3-way circuit with an occupancy switch, would this cause the occupancy switch to work in reverse (or not at all) if the regular switch was toggled? If so, would the best solution be to remove the second switch from the circuit, or just put two occupancy switches in? The switches are nearby enough that only one is necessary for proper operation. DMoore is spot on about using the 3-way occupancy sensor, but off a bit about needing to replace both switches with occupancy sensors. The occupancy sensor installation instructions should show how to connect the device to a 3-way circuit, without replacing the other switch. 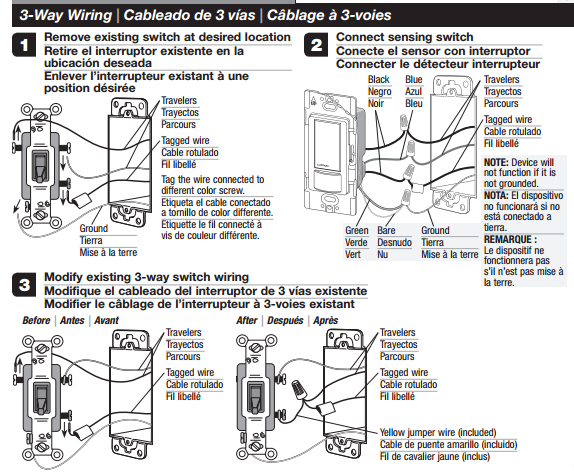 Here is an example wiring diagram from the Lutron Maestro Occupancy Sensing Switch installation guide. However, occupancy sensors only work if they can see you. So if the switch locations are not within line of sight, you may have to replace both switches depending on your operating preferences. You can take out one of the switches but this would keep you from having to cap a box or redoing your wiring and give future flexibility. So you will need 2 3-way occupancy switches since if you just replaced one you could possibly be turning it off. Not the answer you're looking for? Browse other questions tagged electrical lighting switch or ask your own question. How can I replace a 4-way mechanical switch with occupancy sensor(s)? How can I get my fluorescent light fixtures to work with an occupancy sensor? How can I install ceiling mounted recessed occupancy sensors? Is there a 3-way occupancy switch with one sensor being external? Can a occupancy sensor switch and a timer switch be installed in the same three way circuit? 3Way Occupancy Sensor Switch NO neutral or grounding!